While in Baltimore attending the First Provincial Council of Bishops in the USA, Bishop England met four young women willing to begin a religious congregation under his authority. They sailed with him from Baltimore and arrived in Charleston on November 23, 1829. 1829 On December 8, 1829 Bishop England establishes the Sisters of Our Lady of Mercy. 1830 The Sisters open a school for girls in their residence on Friend Street. 1834 The Community moves to a larger house on Beaufain Street which serves as a convent, orphanage, and the Academy of Our Lady of Mercy. 1835 The Community is incorporated by the South Carolina Legislature. 1838 Sisters care for patients in a temporary hospital established for members of the Brotherhood of San Marino. 1839 The Sisters open St. Mary’s Free School for girls, which continues until 1906. 1840 Bishop England lays the cornerstone for Queen Street Motherhouse. 1841 A school for free children of color reopens and operates until 1848. 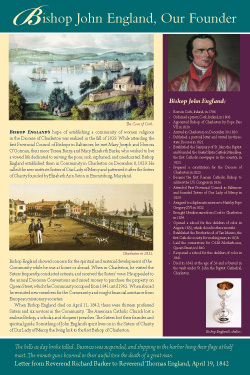 1842 Bishop England dies on April 11. 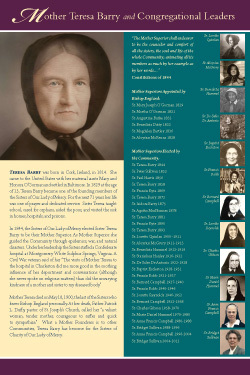 1844 Sister Teresa Barry is elected Superior of the Community. 1845 The Community opens a branch houuse in Savannah, GA which becomes independent in 1847. 1863 St. Joseph’s Academy, Sumter, begins amid the turmoil of the Civil War. 1869 The Community establishes a branch house in Wilmington, NC which becomes independent in 1872. 1870 The Community buys the Russell House, Charleston which serves as OLM Academy, 1871-1901 and Motherhouse, 1901-1908. 1871 The US Congress appropriates $12,000 for the restoration of the girl’s orphanage destroyed during the civil war. 1882 The Community opens St. Francis Xavier Hospital, Charleston, on October 1. 1899 Sisters begin to teach in parochial schools in Charleston. 1900 Mother Teresa Barry dies on May 18. Her successor, Mother Loretto Quinlan opens St. Francis Xavier Hospital Nurses’ Training School in October. 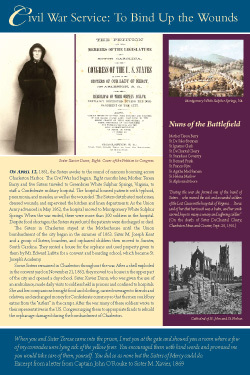 1907 Bishop Northrop asks the Community to take charge of St. Angela Academy, Aiken, SC. 1909 The Community moves to a new Motherhouse at 68 Legare Street. 1915 The Community establishes the Neighborhood House, Charleston. Bishop England High School opens with three OLMs on the faculty. 1920 Three Sisters open St. William’s School, Mine Creek, the first rural parish school in the Diocese. 1929 St. Joseph’s becomes a year round center for the Sumter Missions. 1929 The Community celebrates its 100th anniversary in December. 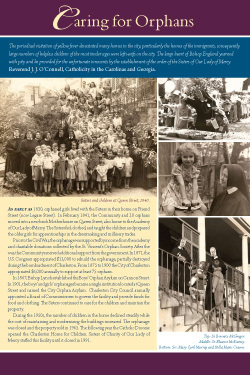 1930 Sisters staff Religious Vacation Day Schools and Camps in the Diocese. 1933 The Community sends Sisters to staff St. Mary’s School, Greenville, SC. 1935 Our Lady of Mercy Junior College opens and continues until 1963. 1938 The Community opens Divine Savior Infirmary in York, SC. 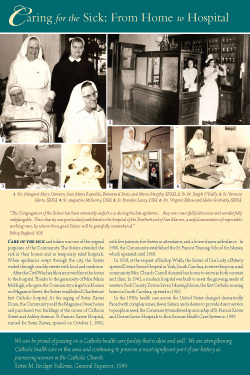 1947 Sisters open a Regional Catechetical Center in Hightstown, NJ. 1949 The congregation adopts a new Constitution and a new name: Sisters of Charity of Our Lady of Mercy. 1954 Sisters begin to teach in parochial school in New Jersey. 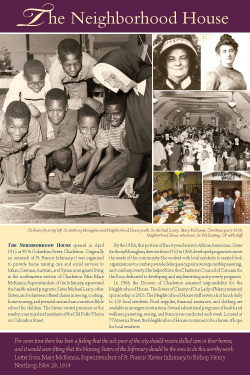 1959 Dedication of the Motherhouse and Novitiate on James Island on April 12. 1963 Divine Savior Hospital Nursing Home opens, the only Catholic facility of its kind in South Carolina. 1965 The City Orphan Asylum at 120 Queen Street closes. 1969 The Community closes 68 Legare Street. 1976 Our Lady of Mercy Associate Program is established. 1979 The Community celebrates its 150th anniversary. 1984 New Constitutions are promulgated on Pentecost Sunday. 1989 The Community establishes OLM Outreach on Johns Island. 1994 The Community joins the Sisters of Charity Federation. 1999 OLM Outreach opens a Wellness Center and a House for Volunteers on Johns Island. 2004 The Community celebrates its 175th anniversary. 2005 The Community resumes responsibility for the Neighborhood House. 2009 Rooted in our heritage of humility, simplicity, and charity, we joyfully reach into the future. A collection of artifacts and history panels are displayed in the Heritage Room at the Motherhouse on James Island. The Heritage Room is open by appointment only. If you would like to view the collection please call 843-795-6083 for appointment. Click on any image below to view a PDF of the history panels.